DigiFab® Systems is an innovative developer and manufacturer of software, fabrics, supplies, and equipment for the digital printing industry. Recognized for its groundbreaking processes and patents for pre-treating fabrics to ready them for use in digital printers, DigiFab® is continuing its innovation in the sign and graphic arts sectors. The product lines currently include pre-treated fabrics, digital textile printers, CAD - RIP software for textile and graphics applications, heat presses, fixers, and steamers. DigiFab® has headquarters in Los Angeles and conducts business globally. Over thirty years of experience in multiple textile production areas, in the research and the development fields, in the CAD and CAM, the knowledge of the real meaning of the digital printing of textiles, the continuous improvement by using the best available technology, and the commitment to support the end user, is the ideal combination that makes DigiFab a reliable option. 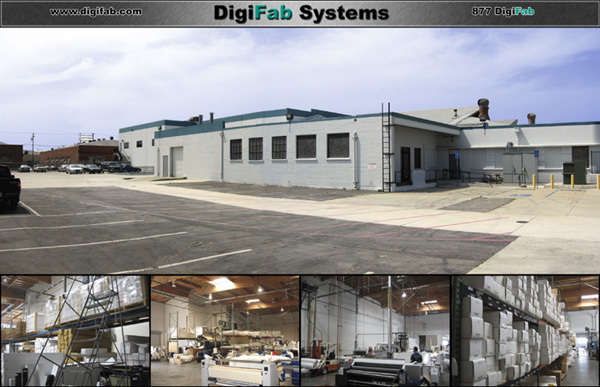 DigiFab® started its operation in Los Angeles, California in 1994 (A&K Textile Express). Our company was the first and the only expert computer-aided full coverage-art studio servicing the West Coast for the Textile and Apparel industries. Our customer basis has been extended throughout the country and overseas, and we are servicing several markets in a wide variety of locations worldwide. Over 30 years of activity in the Textile and Apparel industries is the background of DigiFab®'s management. This experience, the continuous improvement by using the best available technology, and the commitment to support the end user are the main reasons for DigiFab®'s success. In our continuing effort to accommodate our design and production partners in the textile, apparel, and graphic & sign industry, DigiFab Systems strives to ensure CAD to CAM productivity through compatibility. We reinforce a commitment to the industry by being available to help with a consultation and support line open and a hardware engineering staff is always available for backup. Our mission will be to support customer needs as they arise, be they for fabric, special fabric treatments, software, machinery, or consumables for the gowing number of digital printers. As pioneers in the digital textile market, with over 18 years of digital printing experience, we are in a unique position to leverage that experience with an arsenal of tools that our customers will not be able to find elsewhere. DigiFab® Systems handles a company's requirements for a complete package that will assist in planning any textile or graphic project. We are able to offer a turnkey printing solution that supports digital printing for both the graphic and textile markets. The purpose of this web site is to familiarize potential customers with the company and its unique design software and computer systems. DigiFab® Systems, Inc. a pioneer in pre-treated fabrics for digital printing markets, and a leader in CAD system distribution and textile printing service bureau, offers software products and services to support the graphic printing and textile design process. Supporting large format printing, signs & banners, graphics, and textile markets. FABRICS: The Patented DigiFab products have been researched and developed since 1994 to become the first available pre-treated fabrics for digital printing in continuous rolls, paper-backed or un-backed, and ready to use, in commercial boxes, each one containing up to 25 yards of usable product. Other sizes and cut sheets, as well as customized sizes are also available. DigiFab is producing several fabrics with a variety of treatments applied according to the fabric composition and/or the type of inks to be used. This ensures a true color matching and a better color output. DigiFab also offers the possibility for custom treatments. Previous laboratory tests and, eventually, the formulation of new treatments, are required to define the printability of the fabrics to be treated. Once the desired performance is obtained, a minimum yardage is required for customized treatments. This versatility puts DigiFab in the unique position for better serving the needs of virtually any digital textile printing process. Currently DigiFab's products are being successfully used on the best and most popular printers, including Accuplot, ColorSpan, Encad, Epson, Hewlett-Packard, Mimaki, Mutoh, Roland, Dupont, and Stork printers. DigiFab will continue to develop new products according to the upcoming needs of the digital printing of textiles. SOFTWARE: DigiFab's full time U.S. based development staff, hands-on and trade experienced designers work hand in hand with our software experts. Together we have created software which is developed with an understanding of what it takes to get the job done in an easy to use, efficient and reliable way. Offering software products and services to support the Textile & Graphics industries, and the textile design process for companies developing prints for both screen and digital printing in the apparel, textile, and graphic markets. As a pioneer in this market, with over 30 years of screen printing and over 18 years of digital printing experience, DigiFab® is in a unique position to leverage that experience with an arsenal of tools that the customers will not be able to find elsewhere. Because DigiFab® is dedicated to both the textile and graphic industry, its goal is to continually improve and enhance the system and the software for the benefit of the industry. DigiFab® works closely with its customers to fulfill and surpass their needs, and this fact has become a powerful source for new system and software development. DigiFab has released a unique Textile & Graphic RIP called Evolution with the capability to drive large format printers as well as smaller size printers. With an excellent color management, ICC profiles, and the ability to build the repeat on the fly, the new Evolution RIP is what the market was looking for; a better and faster output in the digital textile printing process. EQUIPMENT & MACHINES: DigiFab® Systems' U.S. based development staff together with engineers worldwide, and a global network of dealers, have been able to develop and provide a high quality line of heat presses, textile printers, and other machinery for the digital printing industry. The series of DigiHeat electrical heat presses for heat transferring dye-sublimation prints to polyester and poly-blend fabrics, Eight new heat-press models range from 24 to 136 inches wide, and deliver uniform heat for color consistency. The heat presses can be used for such applications as flexible banners, outdoor signage, POP signs, fabric posters, promotional apparel, tradeshow booths or office decor. Additional features include automatic felt control, cool-down timer, roll-to-roll and sheet-fed options, adjustable temperature and speed controls, and a digital LCD operating display.